This image is intended to illustrate the duplicitous nature of Trump and the way he molds himself to adapt to different audiences and constituencies. The entire world has become the audience for this character that continues to self inflate. 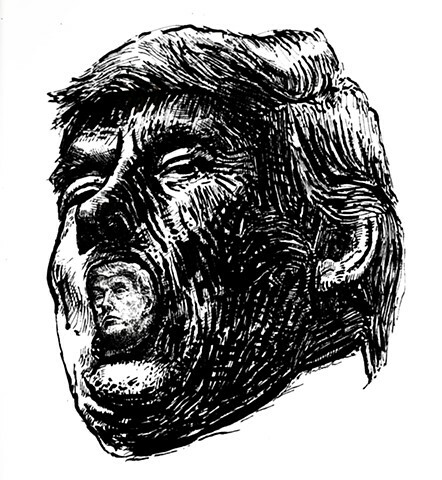 The title of the drawing is “Double Don” is a reference to his tendency to double down on statements that are easily proven false (in addition to duplicity). The smaller head inside the mouth represents the character that is less than qualified, uncertain, confused, and in way “over his head”. The larger head is the over-sized ego, a force to be reckoned with and feared. A head that serves only itself. This image was featured in Little Village Magazine issue 231.